Of all Verdi’s great duets – and there are many – the seduction duet in Act II of Un ballo in maschera is one of his finest. At the heart of this idiosyncratic, multi-genre opera, Verdi constructs an Italian lyric duet of the finest pedigree – one that celebrates the human voice and opera’s dramatic potency. It's midnight. Amelia, wife of Renato, has come alone to a gloomy place. She's hunting for a herb that she hopes, despairingly, will cure her of her love for Riccardo, the country’s leader and Renato’s closest friend. Agitated strings and a roll on the timpani interrupt her prayerful solitude as in runs Riccardo, who without her knowledge has followed her to this dreadful spot. Their initial rapid exchange – ‘I am with you’; ‘Great God!’ – is accompanied by a breathless, urging melody. This soon gives way to a new theme as Amelia attempts to rally her forces; with martial double-dotted rhythms she reminds Riccardo of his position. But he usurps the new theme and colours it with the anxiety of the first, as he accuses her of cruelty. The instability of this passage, both melodically and in its rapid movement between keys, is a hallmark of the tempo d’attacco – the first movement of the traditional Italian grand duet, as codified by musicologist Abramo Basevi in 1859. As the passage that connects the preceding scena (here, Amelia’s aria) to the following duet, it is turbulent by necessity – the introduction of another character of an opposing view, the set-up of the dispute to come. Basevi’s solita forma (customary form) predicts that the tempo d’attacca should be followed by a slow cantabile (singing, lyrical) section, and Verdi obliges. In a lilting 6/8, Riccardo sings softly of the pain he suffers, accompanied by gentle strings and woodwind. But for all this new sweetness, Riccardo’s earlier ardour is never far away; it bursts through in high held notes sung con espressione. When it’s Amelia’s turn to sing, Verdi gives her no simple repeat; instead he engineers an ingenious key change and gives her an inverted form of the melody, while an accompanying staccato clarinet motif confirms the differences between them. There follows the tempo di mezzo, another transitional section that allows the composer the flexibility to introduce another dramatic event. Verdi moves seamlessly from the cantabile section with a 6/8 melody that recalls the yearning motif from the duet’s opening, as Riccardo gently prompts Amelia for ‘just one word’. Verdi then makes every musical change he can – in key, dynamic, tempo and orchestral texture – to flag her revelation: ‘Well – yes – I love you’. 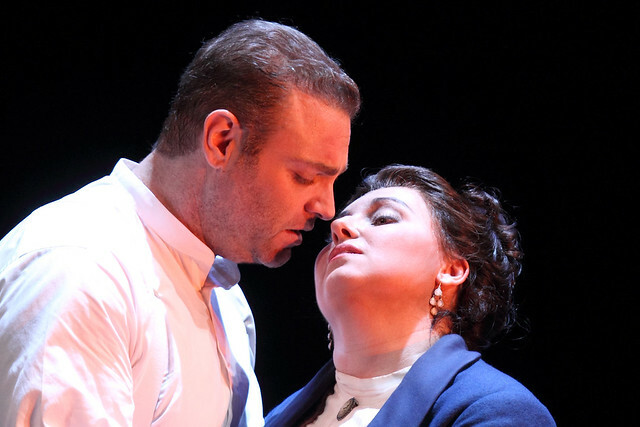 Riccardo responds with such rapture that he sings with Amelia for the first time in the duet. There’s then yet another transition, as Riccardo takes up the double-dotted melody from the tempo d’attacca, now in love triumphant. Rapid string movement takes us into the duet’s final passage, the cabaletta. With harp accompaniment, Riccardo sings a simple melody of almost childlike delight, based around the C major arpeggio. This new melody also incorporates that earlier double-dotted theme, now very far from Amelia’s original intentions. Amelia takes up the second stanza with this time a nearly identical repeat that both suggests her seduction and gives the finale musical stability. After the ritornello – a conventional break in the cabaletta, which Verdi uses to restate Amelia’s declaration of love – the lovers sing an entire stanza together for the first and only time. Mounting orchestral forces beneath them bring the duet to a glorious end. Amelia and Riccardo’s rapture will be immediately undercut by the arrival of Renato, as we know it must be. This wonderful duet shows us the intense love between these two characters, but also foretells the tragedy that will follow in Act III. It brings drama and music together in true Verdi style.